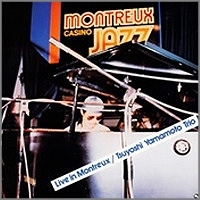 Live In Montreux is the tenth album by pianist Tsuyoshi Yamamoto released by the Three Blind Mice label. Virtually unknown when he made his first recording in 1974, he became one of the most popular jazz pianists in Japan in a just few years, and in 1979 he was invited to play a set with his trio at the renowned Montreux Jazz Festival in Switzerland. This concert shows Yamamoto's strengths and growth as a musician: The strong blues feel, the toe-tapping sense of swing and crystalline lyricism. The great talent of bassist Kunimitsu Inaba and the swinging rhythm of drummer Tetsujiro Obara are very impressive, and together they dazzled the discerning European audience. This is another great, swinging piano trio album and a must-have item for fans of Tsuyoshi Yamamoto! Recorded live at the Montreux Jazz Festival in Switzerland on July 11, 1979. Blu-spec CD is compatible with all regular CD players. Paper sleeve special limited edition.